Please help to continue the tradition by Donating to this worthy cause. Click on the secure link below to make your donation today! You will be directed to the CFR National site. Important -Please be sure to reference Middle Tennessee 2 as the retreat name. Our retreat was featured on Tennessee Wild Side. Click on the link below to see highilights from the retreat at Tumbling Creek! 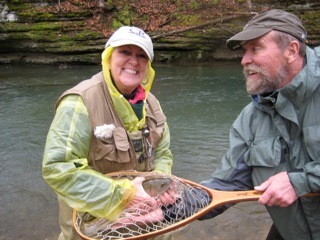 The mission of Casting for Recovery® (CFR) is to provide fly-fishing retreats specifically tailored for women who have or have had breast cancer. We seek to enhance the lives of breast cancer survivors by providing retreats designed to promote and support mental and physical healing. We are committed to socioeconomic and cultural diversity. The two-and-a-half day retreat is offered at no cost to the participants. 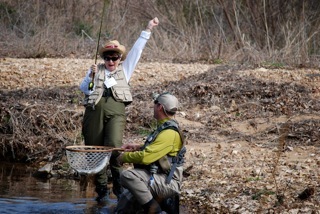 The retreat incorporates both fly-fishing instruction and social support, ending with a half day of guided catch-and-release fly-fishing. 14 participants and up to 20 alternates are selected at random from the applicant pool (based on service area) to attend each retreat. 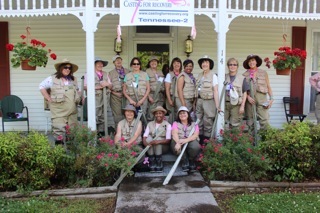 A volunteer planning team, such as the Music City Fly Girls, coordinates the CFR Program in their area. The national office oversees financial, promotional, and registration processes, coordinates participant information, and manages and trains the volunteer base. At least one medical professional, one psychosocial counselor, and four fly-fishing instructors trained specifically for the Casting for Recovery Program staff each retreat. Participants range in age from 26 to 90 and are from many socioeconomic and cultural backgrounds. The program is appropriate for women in all stages of treatment and recovery, and various stages of emotional adaptation to breast cancer. If you are a survivor and would like to participate in our upcoming retreat, please click on the link below and you will be directed to the National CFR site and the on-line application.